In terms of ice flow discharge, one of Greenland’s most productive outlets from the inland ice sheet, if not the most productive glacier in the Northern Hemisphere, the Ilulissat glacier (also known as the Jakobshavn glacier) continues to retreat. The net area change at this glacier since late summer 2000 is a loss of 122 sq km, equivalent with 1.4 x Manhattan Is., retreating effectively 18 km (11.2 mi) in 12 years. 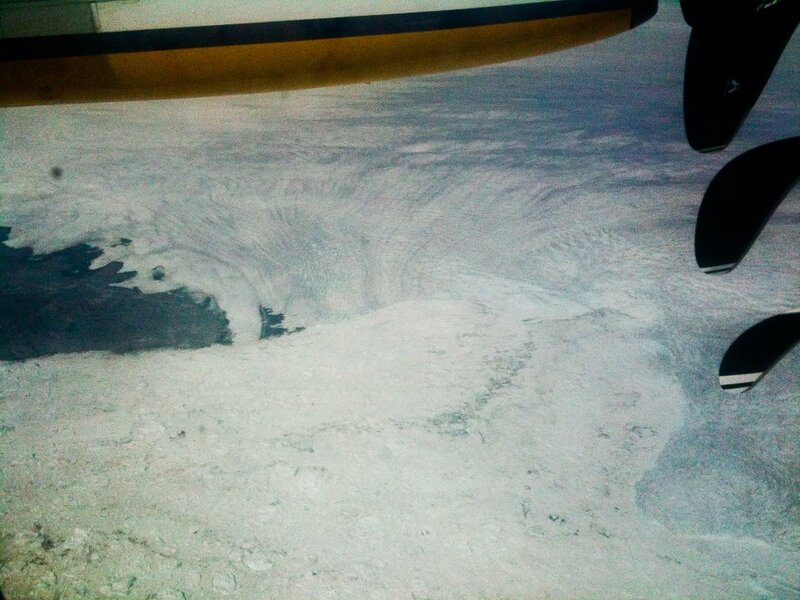 In 2012, this glacier front lost an an area of 13 sq km, measured from August 2011 to August 2012. Thi’s year’s area loss is the largest since the 2007-2008 interval. A concern is that this and other major marine terminating glaciers, as they retreat, they accelerate, increasing their global sea level contribution. Indeed, once the ice shelf in front of this glacier disintegrated, by the end of summer 2003, it’s speed had doubled (Joughin et al. 2004). Area changes at select Greenland marine-terminating glacier outlets are measured in consecutive annual end-of-melt-season NASA MODIS satellite images (Box and Decker, 2011). Here, the same approach is applied to updated our area change estimates to span the 12 annual intervals since year 2000. Flying over Ilulissat glacier this July, it was stunning to notice how retreat has proceeded upstream into a northern tributary, producing effectively two main calving fronts to this ice sheet outlet. The faster stream from the west off the right side of the photo also remains in retreat. The glacier is based below sea level more than 75 km inland (Thomas et al. 2011). The Ilulissat glacier is considered the most productive in the Greenland in terms of ice flow discharge into the ocean (see e.g. Rignot and Kanagaratnam, 2006), even the fastest continuously flowing glacier in the world. Ilulissat glacier ” has a balance discharge (equivalent to total snowfall within its catchment basin) of about 30 km3 ice per year (Echelmeyer et al., 1991), and converges into a rapidly moving trunk ~4 km wide, that flows into a deep fjord on the west coast of Greenland. Until recently, a 15‐km floating glacier tongue was wedged between the fjord walls. VHF‐band radar surveys (J. Plummer et al., A high‐resolution bed elevation map for Jakobshavn Isbræ, West Greenland, submitted to Journal of Glaciology, 2011) show the fastest part of the glacier flowing in a deep trough, more than 1000m below sea level. Between 1850 and 1962, the calving front retreated ∼25 km up the fjord, and then stabilized to within 3 km until the mid‐1990s. During the 1980s and early 1990s, the glacier had a small positive mass balance [Echelmeyer et al., 1991]. Then, probably in 1997, the glacier began to thin (Thomas et al., 2003) at rates that increased to 15 m per year near the calving front, where its speed almost doubled to >12 km per year by 2003 as the floating tongue finally broke up, with continued increases since (Joughin et al., 2008), (Figure 1). Progressive retreat of the grounding line resulting from the rapid thinning reduced the basal and lateral drag acting on the glacier [Thomas, 2004], and by 2005 the glacier was thinning by >2 m per year at a distance of 50 km from the calving front, increasing to >5 m per year between 2005 and 2007. Echelmeyer, K., T. Clarke, and W. Harrison (1991), Surficial glaciology of Jakobshavns Isbrae, west Greenland: Part I. Surface morphology, J. Glaciol., 37(127), 368–382. 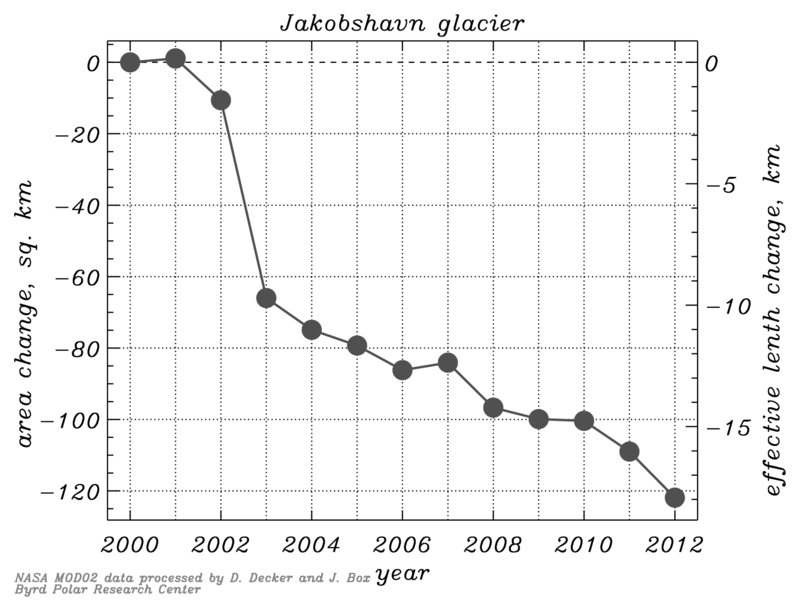 Joughin, I., W. Abdalati, and M. Fahnestock (2004), Large fluctuations in speed on Greenland’s Jakobshavn Isbrae Glacier, Nature, 432(7017), 608–610, doi:10.1038/nature03130. Joughin, I., I. Howat, M. Fahnestock, B. Smith, W. Krabill, R. Alley, H. Stern, and M. Truffer (2008), Continued evolution of Jakobshavn Isbrae following its rapid speedup, J. Geophys. Res., 113, F04006, doi:10.1029/2008JF001023. Rignot, E. and P. Kanagaratnam (2006), Changes in the velocity structure of the Greenland Ice Sheet. Science, 311(5673), 986– 990. Thomas, R. (2004), Force‐perturbation analysis of recent thinning and acceleration of Jakobshavn Isbræ, Greenland, J. Glaciol., 50(168), 57–66, doi:10.3189/172756504781830321. 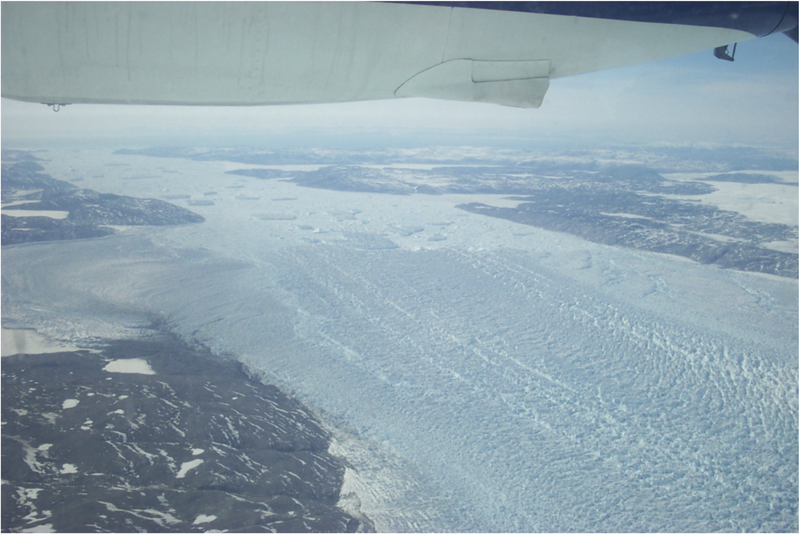 Thomas, R., W. Abdalati, E. Frederick, W. Krabill, S. Manizade, and K. Steffen (2003), Investigation of surface melting and dynamic thinning on Jakobshavn Isbrae, Greenland, J. Glaciol., 49, 231–239, doi:10.3189/ 172756503781830764. Thomas, R., E. Frederick, J. Li, W. Krabill, S. Manizade, J. Paden, J. Sonntag, R. Swift, and J. Yungel (2011), Accelerating ice loss from the fastest Greenland and Antarctic glaciers, Geophys. Res. Lett., 38, L10502, doi:10.1029/2011GL047304. This entry was posted on Wednesday, September 5th, 2012 at 3:15 pm	and is filed under Greenland glaciers. You can follow any responses to this entry through the RSS 2.0 feed. Both comments and pings are currently closed.